After crossing the Bridge with all of its sculptures, the Vigelandsparken leads through an ornate, formally planted garden and then up a set of steps. These steps lead to the Fountain. 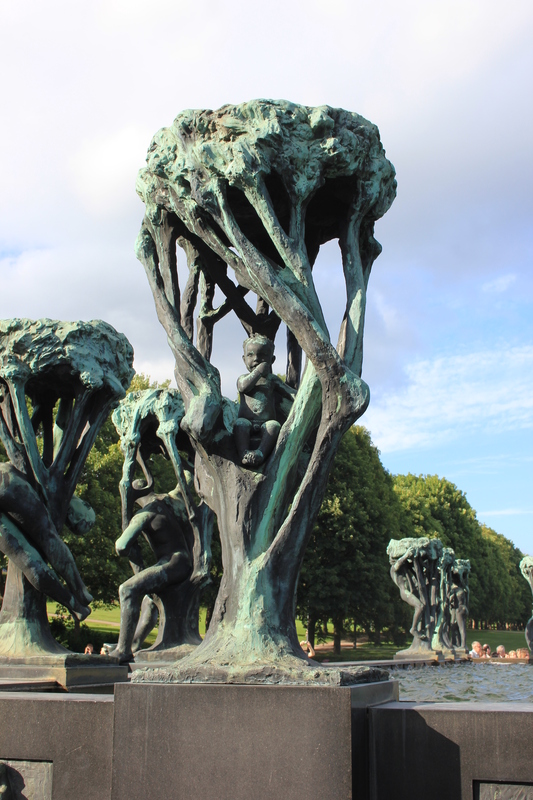 Although this piece was originally designed by Vigeland to be placed in front of the Norwegian Parliament building, the press and public were not supportive of the idea. In the meantime, the initial design started to expand to the point where the Parliament site would have been too small in any event. 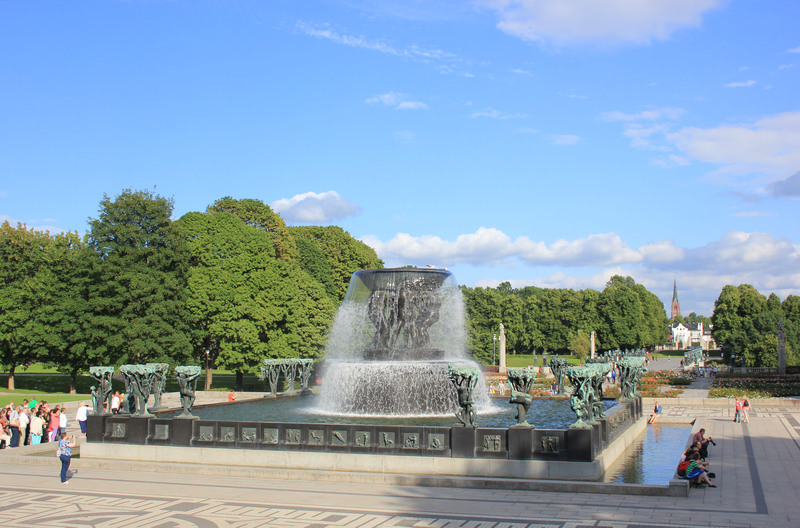 The Fountain is now one of the centre pieces of Vigelandsparken. Its sculptures and reliefs depict the eternal circle of life growing out of death. The Fountain is surrounded by sculptures of trees. Intertwined in their branches are people, from young children to adults. Some of the figures in the trees look quite comfortable. Others look trapped within the branches; they seem to be struggling to break free. Still others are on the outside of their trees and appear to be fighting to get back inside the safety of the branches. Perhaps it is the other way round, though. Maybe the people who look trapped are actually trying to climb back into the trees they have outgrown. Maybe the people hugging the branches from the outside are not trying to get back in – perhaps they have just climbed out and are about to let go. I quite liked this little chap, newly born into protective branches which are now beginning to part to set him free into the world. Around the edge of the fountain are bronze reliefs, depicting the eternal circle of life. 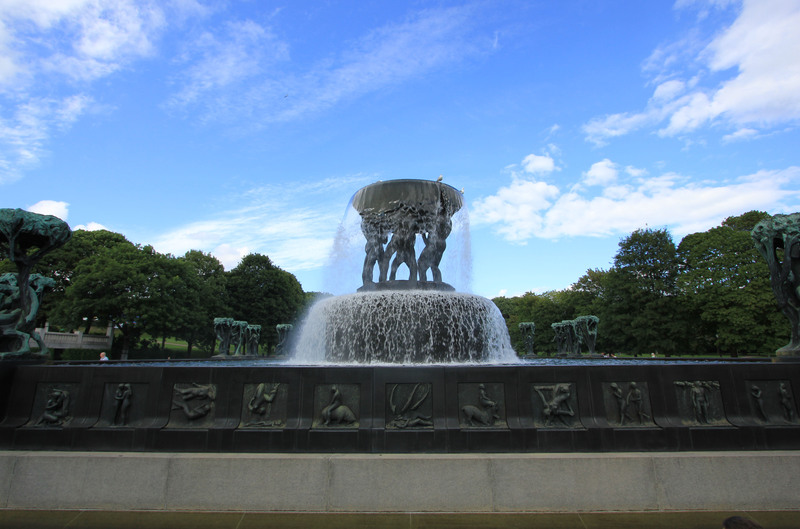 The fountain took so long to complete that Vigeland made 112 of them, although only 60 were used. One depicts two children hugging a skeleton, perhaps to be taken as an embrace of death. Many of the reliefs show figures swirling around as if they are underwater. I quite liked this, because the surface of the water from the fountain lies just above them. Can you see the central relief in the photo above? Three fish are swimming down to a figure lying on the seabed. Out of death grows life. This entry was posted in Norway and tagged art, death, fountain, Frognerparken, Gustav Vigeland, life, Norway, Oslo, park, sculpture, travel, Vigeland, Vigeland Park, Vigelandsparken. Bookmark the permalink.